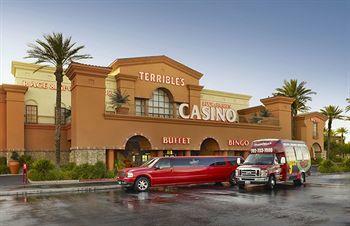 Terrible's Hotel and Casino Las Vegas regular rooms are large and standard, which makes them a good value. 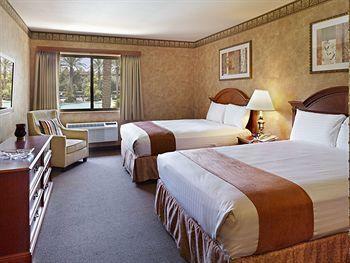 Rooms come equipped with a king bed or two queen beds, table and chairs, a dresser and flat-screen TV. The bathrooms are average, with a single sink and tub/shower combo. The Tower rooms have better furnishings, but are still quite average hotel rooms. Well, big for a hotel room, anyway. If you live in a castle, you probably won't get too excited. 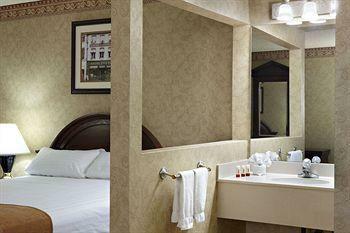 The better amenities are the blow dryers and coffee-makers in each room. You can get either a "courtyard" view or "city" view. Courtyard looks in on the pool area at the center of the complex and we prefer this view since it's quieter than the "city" views, which look out over the street. 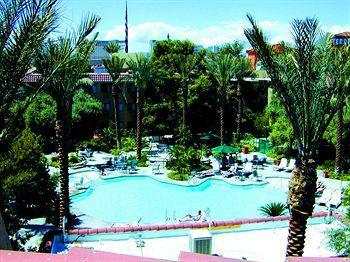 Your west-facing city view may have a nice panorama of the Strip. 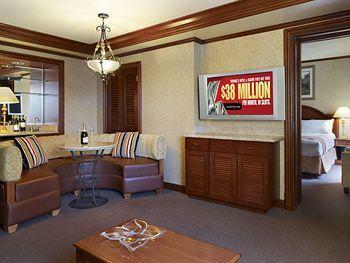 All rooms have free wi-fi, so ruining your vacation is just a click away. Good. Check-in is never too long a wait, but walks to rooms can be somewhat long from the casino since Terrible's Las Vegas is made up of four buildings that surround the central pool area. Terrible's Hotel Las Vegas gives you shampoo/conditioner all rolled into one little bottle. It's really nothing special, but worth stuffing in your toilet kit anyway. Terrible's Hotel and Casino Las Vegas is shooting for the locals and drawing budget-minded tourists, too. 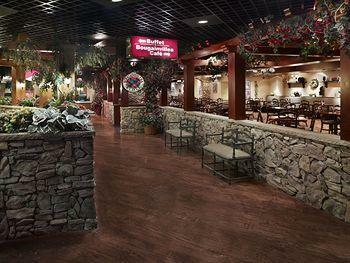 Mostly it's a 40s and over crowd, pretty quiet and dedicated to their favorite slots and video poker. The folks in this casino seem to fit the middle-aged and elderly local category to a T, but it's much more fun to imagine that the patrons here either a) need gas or b) have gas. New look, new resort fee. Silver Seven's resort fee is only $3, and includes WiFi on the Corona Cantina bar area, local calls and an airport shuttle. Not a Terrible deal. This place is terribly cheap, and everything is pretty good quality. 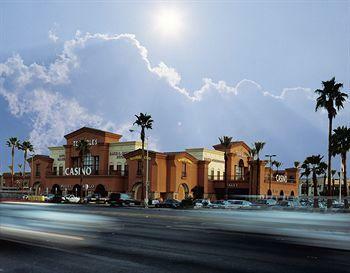 If it's all too terrible though, it's only about a 10 minute walk to the Strip and close to lots of Vegas attractions.. Terrible's Vegas Hotel and Casino only has a few tables in the small, crowded casino, but they include blackjack, craps with the now-standard 3x4x5x odds, 3-card poker and roulette. There are two poker tables too. It's possible that the craps table and poker tables could be closed during very slow times, but the blackjack is always going. Blackjack has a $5 shoe game, craps may let you in for $3 at the slowest times. The roulette wheel has a $5 minimum with $1 chips. From a penny to five bucks. Actually, half the machines are penny. They have almost all video slots, with a few reels among their inventory. The video poker selection is almost overwhelming and there are very few - if any - full-pay machines around. Decent service. Since Terrible's Hotel and Casino Las Vegas caters more to locals, the drink service is not as swift as Downtown, which caters to folks who drink as hard as they gamble. The slot club is fair once you are on the mailing list, but point redemption is pretty stingy. The plus is the frequent double, triple and quintuple point days. If you sit down to a $10 table, ask the pit boss to rate you. At $50 you're nuts for playing here, but you'll probably get a future free room for a couple hours play. Joining the slot club virtually guarantees some very nice mailings for room and food discounts. Terrible's Las Vegas has 22 TV sets, none of which are big. 40 seats are for both sports and race bettors. None are reserved, and all getting pretty worn out. Race seats have a desktop while sports seats just have a small writing area off to the side. Five windows serve the eager gambler. They are backed up with electronic signboards. Yes, the Terrible's Las Vegas waitresses will wander in and offer you booze. Nope. Sorry, but there truly was nothing we could do about it. They wouldn't even let us bring in an ice box full of homemade egg salad sandwiches. Terrible's Hotel and Casino Las Vegas put us in a terrible mood after that little statement. If you're staying at Terrible's Hotel Las Vegas though, they usually give you a buy one get one free coupon for the buffet, so you can stuff your face before you come here and won't need any snacks at all! 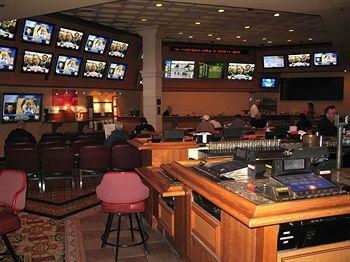 The sports book was nice a few years ago, but very little has been done to keep it looking nice. So, these days it's getting long in the tooth. Check out other Las Vegas sports books if you want a classy affair. Terrible's Las Vegas rooms all pretty much look the same, the standard and the tower rooms. In either you get one king bed or two queen beds, a desk, table with two upholstered chairs and a TV with premium channels, pay movies, video games. Hook up to the wireless Internet, free of charge. Brew a cup-a-joe every morning with your own coffee maker and make sure you spend lots of time in the vanity area outside bathroom so you don't go out looking terrible. These rooms come with one king or two queen beds, a desk, and a 42-inch plasma television with cable channels, video-game console, and pay movies and complimentary wireless Internet. Pull the blackout drapes shut so you can sleep all day and wake up to the leftovers you drunkenly bought and stored in your refrigerator request an iron/ironing board to it heat up with. Wait, that iss what those are for, right? In my Kindle book Vegas Done Right! I do not name the hotels I write about. This is one of them, though. The casino area is crowded and the smoke can be cut with a knife. If you're sensitive to that, stay away, but if you're not, there's decent video poker at every (and I mean EVERY) level. The coffee shop has a $4 breakfast, in case you don't want the $6 buffet breakfast. I've never seen a time when $5 live blackjack wasn't offered. Drink service is regular even (especially?) at the penny machines. A smart and disciplined player will find it hard to lose more than $60 per day here. If you want value, here it is. I stood for 1 night due to a change of my sons school function, the booking was short notice and i didn't know anything about this place. I'm glad to inform you that it was a great visit. Service was awesome, fast and friendly. The room as a point of reference was on par with Harrahs or Flamingo, bed was fine room was for the most part ok. Location was 10 minutes walk from the strip (cross Koval and you are there) and was well lit. i would recommend it and book another room.